Did you know that she once played a young Kristine Hermosa? Before she starred in Ang Probinsyano as Cardo Dalisay's wife Alyana, and like her fellow celebrities before her, Yassi Pressman was a child actress who appeared in soap operas at the start of her career! 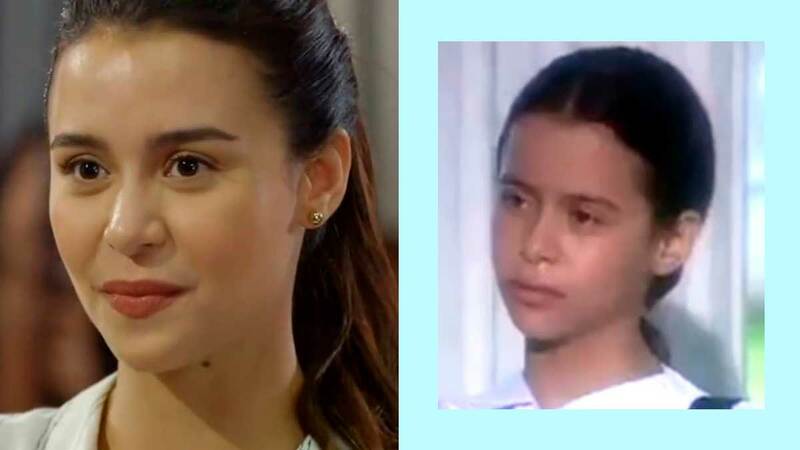 We bet you didn't know that Yassi played the role of young Luisa (Kristine Hermosa) in this soap opera remake when she was only 11 years old! It's honestly hard to get over how much Yassi and Kristine resembled each other. Gulong ng Palad tells the story of star-crossed lovers Luisa and Carding (TJ Trinidad) which started as a friendship when they were kids. Carding, who's from a rich family, is forced to move to the United States and promises to keep in touch with Luisa. They meet again ten years later. Ilumina was a fantasy TV series on GMA-7 about witchcraft and sorcery and featured two groups, the Black and White sorcerers, who are battling for the Book of Magic called "Ilumina." Yassi was a member of the "white" sorcerers. The show starred Rhian Ramos, Jackie Rice, and Aljur Abrenica. Yassi played a recurring character in this youth-oriented show about the joys and struggles of teenage life where her love interest was a guy named Mac, played by actor Ken Chan. After two years and a total of 86 episodes, Tween Hearts aired its finale on June 10, 2012. Rhoda, a self-centered and scheming character, makes it a habit ot make her adopted sister Angelina's life as miserable as possible. She takes after her kontrabida mother played by Isabel Granada. The title role for the morning soap opera was played by Bea Binene. This sequel to the 2008 series Luna Mystika features Yassi as Kate, the mean-spirited onscreen partner of Aki (Kristoffer Martin) who is in turn the character Luna's protector and confidante. The mystery-thriller features Yassi as Sophie, one of the girls who are staying at a dorm filled with secrets, lies, and even a potential killer. The show starred Lauren Young as a student of Mass Communication at Branwood College who moves into the Holy Spirit Manor, a place where a student named Maika Benitez (Wynwyn Marquez) died. Yassi played the younger version of Jessa Zaragoza in this TV series about two lovers (played by Kristoffer Martin and Kim Rodriguez) who grew up together on an island and who are eventually separated. She played the role of Mich opposite Jake Vargas as Jam in the Magpakailanman special which told the story of the popular online love team JaMich, specifically Jam's battle with lung cancer. Yassi has also starred in several TV movie adaptations of Wattpad novels which were shown on TV5, including the adaptation for Mysterios Guy At The Coffee Shop where she was paired with Vin Abrenica. The story revolves around Allison, an introvert and bookworm from an all-girls school who chances upon Cedrick, a guy who, for some reason, always hides under a hoodie. In 2016, Yassi entered the PBB House as a celebrity housemate on its seventh and longest season to date. One memorable episode from the show was when Yassi broke down in front of the camera because she had to miss her dad's 87th birthday celebration while inside the house. While holding a cake, she sang "Happy Birthday" to her dad as they both expressed how much they missed each other. Yassi plays the wife of Coco Martin's character Cardo Dalisay in the action-drama television series. A reporter by profession, Alyana marries Cardo and they eventually have a son who sadly passes away due to a staged "terrorist" attack. Conflicts and emotions arise and Alyana even decides to leave Cardo for another man but he succeeds in winning her back. Aside from acting in films and teleseryes, Yassi has also been very active as a dancer, host, and performer ever since she entered showbiz. She was part of the variety shows SOP, Party Pilipinas, Born To Be A Star, and Sunday All Stars. We recently see her on the ABS-CBN weekend variety show ASAP. We can't wait to see what other roles Yassi will be palying in the future. Keep slaying, girl!